Another modulation scheme is Amplitude Modulation, where the amplitude (or volume) of the carrier is modified proportionally to the signal. One disadvantage of AM is that the receiver amplifies and detects noise and electromagnetic interference in equal proportion to the signal, which is why AM radio signals are not as clear as FM radio signals. 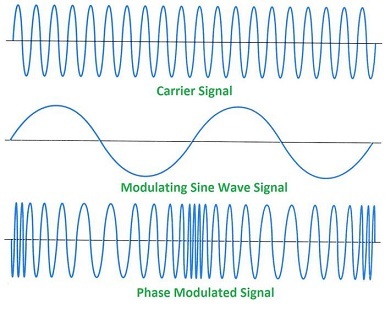 The third major modulation scheme is Phase Modulation where the phase of the carrier is modified proportionally by the input signal. PM looks very similar to FM, but it's much clearer what is going on when you look at the PSK signal below. In order to smooth the transitions in digital modulation there are "Gaussian" variants e.g. GFSK (Gaussian Frequency Shift Keying). 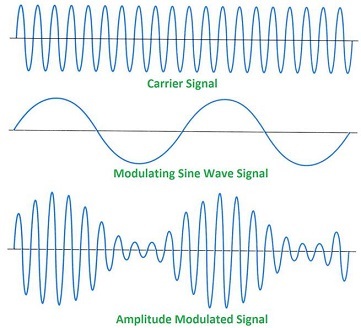 This reduces the bandwidth of the signal channel by applying a Gaussian filter prior to modulation.